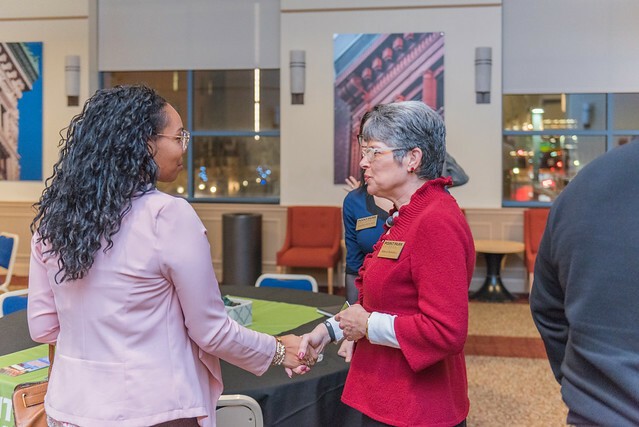 From fire chiefs and EMS professionals to business and borough administrators, alumni from a variety of service professions were warmly welcomed Dec. 5 at Point Park University's public administration reunion event. Attendees had the opportunity to catch up with faculty in the program as well as network with fellow alumni working in the public administration field who graduated between 1975 and 2017. Also at the event, Robert Skertich, Ph.D., associate professor and coordinator of the public administration program, spoke about the new initiatives for the Rowland School of Business and facilitated a discussion on the latest trends in the field. "This was a chance to meet some of my classmates, professors and fellow alumni in person, many of whom I had only talked with through my online classes," said Lee Schmidt '16, department business administrator for the City of Pittsburgh Department of Public Safety, Bureau of Police. Schmidt added: "My degree from Point Park expanded upon my knowledge to make me a prime candidate for my current position. I also really liked the flexibility of Point Park's online public administration program and having professors with real-world field experience."